Eurostar, the high-speed rail passenger service that links Britain and mainland Europe, today announced that it has awarded the design contract for the interior refurbishment of its fleet to Pininfarina. Pininfarina has been appointed after a lengthy and rigorous selection process. The company is a world-class design house that is best known for its work in the car industry, with prestige marques such as Ferrari and Maserati as well as volume manufacturers including Peugeot, Alfa Romeo, Ford and Volvo. It is also developing the revolutionary, electric Pininfarina BlueCar that is due to go into production in 2011, and which will cut carbon dioxide emissions from road travel. Importantly for Eurostar, Pininfarina also has extensive experience in the rail industry, having designed the interiors and exteriors of Italy’s high-speed trains; rolling stock for Swiss, Danish and Norwegian Railways; automated light rail cars in Lille, northern France; and trams for cities in Italy, Greece, Sweden and Turkey. Pininfarina will be responsible for the full interior design including styling and engineering, and the exterior livery. 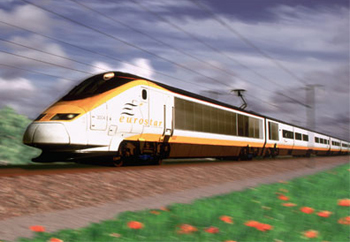 The 28 trains in the Eurostar fleet will be fitted out by SNCF, and the first ones are due in service in 2012. Lowie Vermeersch, Design Director at Pininfarina, commented: "We’re delighted to be awarded this important assignment. Together with Eurostar we’re determined to create a design that focuses on a great travel experience, thus mixing our style and outstanding functionality with a clear vision of future train travel." 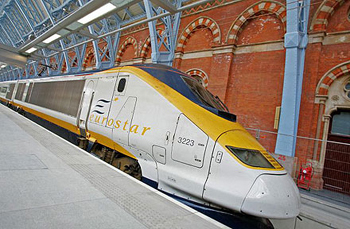 Eurostar is the high-speed train service linking St Pancras International, Ebbsfleet International, Ashford International, Paris, Brussels, Lille, Calais, Disneyland Resort Paris, Avignon and the French Alps. The Eurostar fleet consists of 28 inter-capital Class 373 trains, built by GEC Alsthom (now Alstom) and brought into service in November 1994. Each train consists of two power cars and eighteen carriages, including six first class, 10 standard class and two buffet cars, and seats a total of 750 passengers. The trains travel at speeds up to 186mph (300 km/h) – at least 50% faster than any domestic UK rail service. Since 1994, the Eurostar fleet has carried more than 95 million travellers and covered more than 75 million miles (120 million km). Eurostar is the first train operator in the world to make all passenger journeys ‘carbon neutral’ at no extra cost to travellers. As part of its Tread Lightly environmental plan, Eurostar is also committed to reducing carbon dioxide (CO2) emissions by 25% per traveller journey by 2012. Research has shown that a Eurostar journey between London and Paris/Brussels already generates just one-tenth of the CO2 emissions of an equivalent flight. Eurostar is an entirely separate business from Eurotunnel. 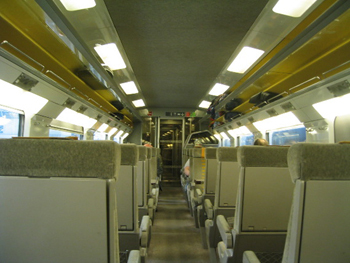 Eurostar operates high-speed passenger trains, while Eurotunnel operates vehicle shuttle services and the Channel Tunnel itself. Eurostar is Eurotunnel’s biggest customer. Pininfarina is a leading Italian design house, flexible partner for OEMs and self-branded car manufacturer. With a history that dates back to 1930, Pininfarina offers the market - both OEMs and final consumers - competitive products and services based on its brand values: creativity, experience and innovation. Its activities include all-around design, engineering and manufacturing services. By 2011, the Pininfarina luxury Electric Vehicle will be launched. The company has more than 3,000 employees and premises in Italy, Germany, Sweden, Morocco and China. Clients include Ferrari, Maserati, Alfa Romeo, Ford of Europe, Peugeot-Citroen, Tata, Brilliance, Chery and JAC. The Group also includes Pininfarina Extra, specialising in interior and product design, architecture, yachts and airplanes; clients include Alenia Aeronautica, Guerlain, Motorola, Jacuzzi, Lavazza, Snaidero and 3M.